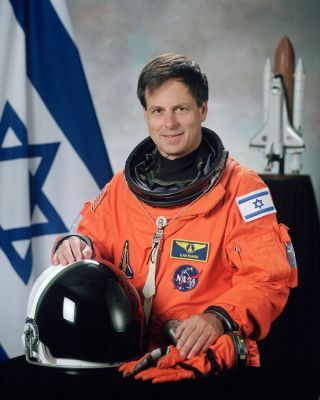 Ilan Ramon (Colonel, Israel Air Force), payload specialist representing the Israel Space Agency (ISA), shown in November 2001. CAPE CANAVERAL, Fla. — When shuttle Columbia lifts off on its 16-day marathon science mission, payload specialist Ilan Ramon will be strapped into a seat on the middeck, making history as Israel's first astronaut. A colonel in the Israeli Air Force and the son of a Holocaust survivor of Auschwitz, Ramon's principal job will be to operate an experiment that tracks dust particles from sandstorms blowing through Earth's atmosphere, including those that swirl about the Mediterranean region. Ramon, 48, says he's fully aware that the topic of Israel often divides people, but he hopes his presence on the STS-107 shuttle mission will do just the opposite. "There is no better place to emphasize the unity of people in the world than flying in space. We are all the same people, we are all human beings, and I believe that most of us, almost all of us, are good people," Ramon said. Nevertheless, security at the Kennedy Space Center is as tight as its been since the Sept. 11, 2001 terrorist attacks on America. Although no specific threat has been made, NASA security officials recognize that Ramon's presence on the seven-member crew might bring out the worst in some people, but the rookie space flyer said he doesn't fear for himself or his family. "I think that NASA security is doing everything needed. I feel great. I think everyone feels safe," said Ramon, whose family includes his wife, Rona, and four children. Liftoff remains set for between 10 a.m. and 2 p.m. EST (1500 and 1900 GMT) Thursday. The exact launch time will be announced Wednesday. Technically all systems looked good for launch, mission managers reported Monday. Even the weather forecast is cooperating with a 95 percent chance that conditions will be favorable during what will be a two-and-a-half-hour launch window. Conditions are expected to rapidly deteriorate if a launch attempt on Friday is necessary. Unwanted clouds, rain and wind drifting into Central Florida as the weekend approaches add up to a 40 percent chance of acceptable weather. Once in space, work on the 86 payloads supporting 79 science experiments will be done around-the-clock with the crew splitting into two shifts. Ramon will serve on the red team with mission commander Rick Husband and mission specialists Kalpana Chawla and Laurel Clark. "I'm sure it's going to be a very special experience," said Ramon, who flew in the 1973 Yom Kippur War and has logged more than 3,000 hours in various jet aircraft and another 1,000 hours in F-16 jets alone. Israel's involvement on this flight dates back to a 1995 agreement between then-President Bill Clinton and then-Foreign Minister Shimon Peres. Ramon was selected soon after and began training for the mission in 1998. A self-described "secular Jew," Ramon felt called to honor his heritage and religion during the mission by eating some kosher food and looking for a way to practice the Sabbath. Although Jewish astronauts had flown in space before — most notably Judy Resnik, who was lost in the 1986 Challenger disaster — Ramon's queries caught the space agency a little off guard, but officials were able to handle the requests. "As an Israeli and as a Jew I asked NASA if it would be possible to supply kosher food for my menu in space," Ramon said. "I was surprised and overwhelmed with the effort NASA put in trying to accommodate my request." Dealing with the Sabbath proved a little more interesting and sparked a lot of spirited debate among Jewish teachers. The Jewish Sabbath, known as Shabbat, goes from sundown on Friday to sundown on Saturday each week, or once every seven days. The question Ramon and the teachers faced was how do you count the sun downs when the spaceship you're moving in sees 17 sun downs each day as it circles the planet at 17,500 mph? Ultimately the consensus emerged that Ramon would stick to the way sun downs are measured on Earth, and his observances would take place only if it didn't interfere with the mission timeline. Another way in which Ramon plans to commemorate the history of Jews is by carrying into space a pencil drawing entitled "Moon Landscape." Created by a 14-year-old boy named Peter Ginz, it's a drawing that shows how Earth might look if you were on the Moon and looking back at our home world. What makes the drawing so important to Ramon is that it was created while Ginz was in a Nazi concentration camp, before the boy died in 1944. "I know my flight is very symbolic for the people of Israel, especially the survivors, the Holocaust survivors," said Ramon. "Because I was born in Israel, many people will see this as a dream that is come true."